Excipial 10% Urea Hydrating Healing Lotion - (1) 6.7 Fl Oz - Triple Action! About 7 years ago I began using this in the washing machine with wonderful results. Then, because my scalp was always itchy and irritated, I began to use it as shampoo a few years ago. Now it is our bubble bath in the tub, our dishwashing soap and is the ONLY soap we use in our lives. 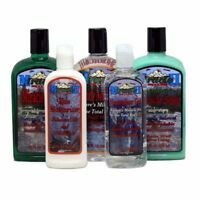 It does a wonderful job and leaves no odor or residue behind. I do rinse my hair and body by pouring 1TLBS apple cider vinegar in a gallon jug or warm water over my head and body. In the washing machine I add about 1/4 c Boraxo to my laundry in order to kill any type of mold and fungi lodged in towels or sweaty clothes. For a sensitive person this is the answer to all your cleaning needs. 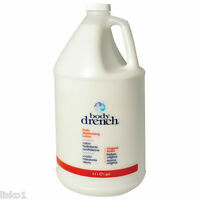 This one gallon make approximately five gallons after it is reduced. I mainly use it in the shower and also use it a a bubble bath for my little brother. About a quarter cup or one squirt makes a lot of bubbles in his bath tub. It takes me about a year and a half to go through this one gallon and I really appreciate that immensely. I have to stay away from perfume and dyes in any soaps and this has worked for me for about ten to fifteen years now. 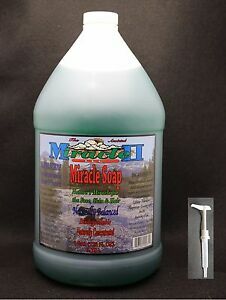 EVERYONE NEEDS TO USE MIRACLE 2 THERE ARE THOUSANDS OF USES I BRUSH MY TEETH WITH IT CLEAN WITH IT AND OF COURSE SHOWER WITH IT AND SCRUB MY DOG WITH IT. EVEN TAKE IT FOR CONSTIPATION AND PUT ON YOUR BODY IN SHOWER AND DONT WASH OFF JUST TOWEL DRY, USE A FOAMER IT IS SO CONCENTRATED YOU WONT NEED MUCH KEEP USING IT EVERYDAY AND YOU WILL NOT BE SORRY, GET RID OF ALL CHEMICALS THIS IS THE WAY TO GO!!! been using this soap for over 15 years. still love it! I have used this product for 12 years. I had shingles on the majority of one side of my body, including my face. 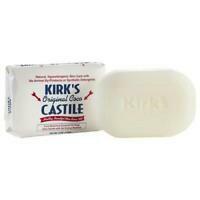 I used this soap to bathe during this time. I use it in my dispensers. I use for hair. I use it in laundry for my delicates. It's a wonderful product!